A healthy body and soul is important, but enjoying your home is just as essential! Transform your home into an oasis of calm with thought-provoking quotes and serene images from nature. Hang up a motivational poster that gives you some extra energy and fills your home with positive vibes. In our Motivational category you’ll find motivational posters with thought-provoking quotes, elegant phrases and soothing nature posters. Decorate your home or workplace with inspirational art that gives you positive energy or reminds you of the things you consider important in life. Hang up encouraging posters with positive messages like “Feelings are much like waves, we can’t stop them from coming but we can choose which one to surf” or “Live more Worry less”. 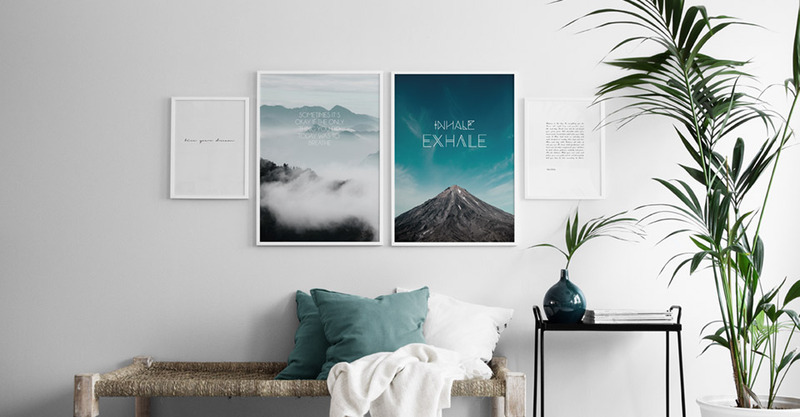 Compose a gallery wall by combining soothing images of nature with thought-provoking quotes to create a lovely ‘feel-good’ feeling in your home. We have minimalist text posters, stunning nature pics, and motivational quotes set against a gorgeous natural backdrop – all of which can be combined.